When you have been injured as a pedestrian by the careless or negligent act of a motor vehicle operator, you want an experienced Long Island pedestrian accident attorney to help you pursue full and fair compensation for your injuries. The losses sustained in a pedestrian accident can be substantial. You may not be able to work for a long time, if ever. You may need long-term medical care, including rehabilitation or physical therapy. You may live every day with excruciating pain. The legal team at Rosenberg & Gluck, LLP can help. At our firm, personal injury has been the sole focus of our practice for nearly 30 years. Since 1983, we have helped thousands of people get monetary compensation for damages caused by the careless or negligent acts of others. We combine extensive experience with considerable skill and knowledge to help you get the results you seek. For a free initial consultation, call our Suffolk County office at (631) 451-7900. Municipalities must manage both pedestrian and vehicle traffic to keep roadways safe for all. If you’ve suffered an injury in a pedestrian accident, know what next steps to take to protect your health and a possible future lawsuit. Proper evidence and testimony play critical roles in determining the sequence of events of an accident and determining which parties are at fault. Seeking medical treatment, filing a proper police report, collecting relevant contact information, documenting the scene, and informing the appropriate parties in a timely manner all contribute to a smooth and effective lawsuit. The steps you take at the scene can affect your entire case. Accidents involving pedestrians can cause severe injuries. Under New York, the insurance policy on the vehicle involved in a pedestrian accident is responsible for all medical bills. The sheer size and weight of a car in comparison to a person means pedestrians and cyclists can suffer greatly in an impact, regardless of driver’s speed. Unlike vehicle-on-vehicle collisions, a pedestrian does not have the protective shell of an automobile to take the brunt of the impact. If a pedestrian suffers injuries, any available party should call 911 for both emergency medical care and police assistance. Ambulance staff can help treat injuries and provide transportation to the hospital when necessary. Police officers will be able to conduct a report, helping to gather evidence and determine the exact causes of the incident. When victims of an accident remain in the roadway there is the risk of secondary accidents, especially on urban roadways. Parties should not leave the scene of an accident, but it’s important to move to the side of the road, if possible. Pedestrian victims left in the road are at a greater risk for suffering additional injuries. The police will work to collect necessary information, but the injured party should also get the contact and insurance information of the driver if at all possible. When the victim cannot do so, the driver should make attempts to gather this information as well. If the victim has someone he or he knows at the scene, that person should help with the process. In addition to the driver’s information, it is important to have the contact information of any available witnesses. Again, the police may collect most of this information, but having it first-hand can help when you do not know any of the other parties on the scene. Driver and witness information plays a role in determining the sequence of events and in progressing any personal injury lawsuits. Accident scenes often do not stay as they are for long, especially those that block busy roadways. Pictures or videos of the accident scene can serve as evidence for both the cause and severity of the injury. Proper documentation of the scene can contribute to determining appropriate compensation awards in a lawsuit. Once they have received proper medical treatment, victims of pedestrian accidents should contact a skilled Long Island pedestrian accident attorney to begin their claim. When the accident is the result of driver negligence, victims become eligible for compensation. A lawyer can help with investigating the accident, filing a claim, navigating settlements, and representing the case in court. Drivers involved in pedestrian accidents should contact their auto insurance providers. The insurance company will be able to discuss available coverage and communicate with the pedestrian’s attorney. Neither party should discuss any form of fault at the scene of the accident. Even speculative statements can become evidence for liability later in the case. Drivers and pedestrians should keep their exchanges to relevant contact information and leave the rest to litigation. If you have questions after a pedestrian accident on Long Island, talk to an attorney with experience in NY traffic law. Who Is at Fault in a Pedestrian Accident in New York? Many circumstances can lead to a pedestrian accident, meaning that the at-fault party varies on a case-by-case basis. The liability for the accident affects who receives compensation, so both drivers and pedestrians may aim to put the blame for the incident on the other party. In some cases, it will be obvious which party is responsible; in others, the circumstances may be more confusing. Pedestrian accidents are often due to driver negligence. Drivers have a duty of care to pedestrians in addition to following other rules of the road. When a driver does not fulfill that duty of care by participating in distracted driving, disobeying traffic signals or other road laws, not yielding to pedestrians when appropriate, or driving under the influence, he or she is not fulfilling that duty of care and is likely at fault for the accident. Drivers also must take extra precautions when driving in areas where children are present. Children often do not fully understand the rules of the road and may act unpredictably around vehicles. When driving near school zones or any other location where children are present, drivers might be liable for potential accidents. Even though pedestrians often take much more damage than drivers in automobile accidents, that does not mean pedestrians cannot be at fault. New York pedestrian laws place restrictions on proper road conduct. Pedestrians must obey traffic signals, use crosswalks and sidewalks when available, and yield the right of way to vehicles when crossing a street without any crosswalks. Jaywalking and other inappropriate crossing methods are some of the leading causes of pedestrian at-fault accidents. Pedestrians also may not walk on or along any state highways unless it is necessary due to an accident or stalled vehicle. Violating these laws can make the pedestrian at fault for the incident. In many cases, the accident is not the fault of just one party; more than one party may have contributed to the situation. This can occur when a pedestrian is not following proper road rules while a driver is not driving with his or her full attention on the road. In this case, both parties are at fault for the accident. New York is a comparative negligence state. This means that while being at fault does not automatically bar an injured party from receiving compensation, the amount of compensation he or she can receive varies based on how much at fault he or she was for the accident. For example, if both driver and pedestrian share equal blame, any injured parties would only be able to recover 50% of his or her damages as compensation. If the driver is more at fault than the pedestrian, the pedestrian would be able to recover more compensation. The court determines the fault of the accident first and then proceeds to adjust any applicable damages. ccident and are unsure of who is at fault, contact a Long Island personal injury lawyer at Rosenberg & Gluck, LLP. How Can a Long Island Pedestrian Accident Lawyer Help? An accident between a car and a pedestrian can be devastating for the pedestrian. In many cases, before you have even properly recovered, insurance companies may be hounding you for information or settlement requests. Focus on returning to your ordinary life after an accident with help from the attorneys of Rosenberg & Gluck, LLP. Insurance companies are in business to make money and to that end, they often take shortcuts and try to deny benefits. They are also likely to attempt to contact you shortly after your accident. Many companies will call you on the same day, hoping to take advantage of your vulnerability to secure a low settlement amount or get you to make some statement or admission that will lower the amount they have to pay. Having an attorney means you will have someone experienced in speaking with insurance carriers on your side. Once you retain Rosenberg & Gluck, LLP, we will handle all communications with the insurance companies involved. Insurance companies know which firms will take a case to trial and which firms take whatever they are offered in settlement. t Rosenberg & Gluck, LLP, we prepare all our cases as if they are going to be tried. This helps us maximize recovery for all our clients. Our Long Island pedestrian accident lawyers have extensive trial experience with all types of injury cases. When do you file your claim? What procedures need to happen? How will you handle settlement offers? What’s a fair amount of compensation? Which ways can you counter an insurance company’s lawyers in court? One of our personal injury attorneys can help you answer these questions. They will be familiar with all the potential elements of a pedestrian accident and can help you complete all the steps to file your claim. They can also help you determine the proper amount of compensation for your injuries and fight for your rights in court. Our attorneys have over a 100 years of combined experience in trial. Let us use that experience to help you navigate your case. You can take steps to obtain evidence for your case at the scene of the accident. While these photos and witness testimonies can play key roles in determining fault, some incidents require further investigation. Rosenberg & Gluck, LLP will be able to investigate all possible facts and circumstances needed for a successful trial. You can focus on the rest and recovery while our firm’s investigators handle the groundwork for you. Not all lawsuits need to reach trial. In fact, alternate methods, like mediation and arbitration, can solve many. Your Long Island pedestrian accident attorney is able to determine the best approach for your case. If it’s possible for your case to resolve without heading to court, you can save time, money, and emotional energy. Many insurance companies will offer settlement offers before or during a trial. A settlement amount is often less than you could receive during trial. However, a settlement is a guaranteed amount of money, while a trial may not always go in your favor. Accepting a settlement isn’t necessarily wrong, but you need to ensure you are making an informed decision. Our attorneys can help you determine when it is best for you to accept a settlement and if the amount appropriately covers the extent of your damages. Most personal injury cases involve a statute of limitations of three years after the date of your accident but “no-fault” applications must be filed within 30 days. If your ‘no-fault” is not properly filed with 30 days you may forfeit all payments for medical coverage and lost earnings. At Rosenberg & Gluck, LLP, we will file your “no-fault” application for you immediately. If you don’t file your claim before this time expires, you may lose your right to compensation. When you partner with one of our attorneys, we work to submit all your necessary filing and documentation on time so your case may proceed without any obstructions. The help of a skilled Long Island pedestrian accident lawyer can make it possible for you to have a successful claim and achieve the full extent of your rightful compensation. At Rosenberg & Gluck LLP, we work hard to give our clients the best chance of successful outcomes. Car accident claims often rely on the responsible party’s insurance to cover damages. This is why all states have minimum insurance requirements for drivers, including New York. For pedestrian accidents in which the driver is at fault, the injured pedestrian’s compensation will likely come from the driver’s auto insurance. The minimum liability insurance limit in New York is $25,000. If drivers are uninsured or do not have sufficient coverage to handle the scope of the injuries, the injured pedestrian may be able to recover damages through uninsured or underinsured motorist coverage. Even though the pedestrian was not in a vehicle at the time of the accident, auto insurance can still cover damages. Both uninsured and underinsured motorist coverage plans can have limits for how much an injured party may recover. Every accident is unique, so determining exact amounts or dates for compensation can be challenging. Proving fault is a crucial piece of any pedestrian accident claim, and knowing how much compensation the victim can recover for all possible damages is also key to a successful case. At Rosenberg & Gluck, LLP, a Long Island pedestrian accident lawyer can help you win the most compensation for your injuries. Pedestrian accidents can be the fault of both the driver and the pedestrian, or even shared between both parties. Negligence by either party is often the core cause. Consider the most common causes of pedestrian accidents. Distracted driving is one of the most prevalent causes of auto accidents, and the same applies to those involving pedestrians. Any situation in which a driver is not giving his or her full attention to the road constitutes distracted driving. This can include texting or otherwise using a cell phone, looking away to adjust the radio, having a conversation on the phone or with other passengers, and leaning over to grab a fallen object. Distracted drivers may not notice pedestrians are in the roadway. The delayed reaction time in recognizing a pedestrian can mean the vehicle does not have sufficient time to slow down before a collision. Many drivers are aggressive on the road hoping to get to their destinations quicker. This behavior can lead to violations of traffic laws. Many pedestrian accidents occur when motorists are turning at unsafe speeds or without checking the path of their turn correctly, resulting in collisions with approaching pedestrians. Speeding also leads to pedestrian accidents. Drivers and pedestrians alike have situations where they must yield the right of way to another party. Motorists are to allow pedestrians to cross whenever traffic signals dictate and on any crosswalks. Likewise, New York law dictates that pedestrians must yield the right of way to vehicles when attempting to cross a road that does not have a readily available crosswalk. Pedestrians should also cross only at available crosswalks and follow any traffic signals. Everyone uses the right of way to determine when it is safe for individuals to be on the road. Failure on the part of motorists and pedestrians alike to give proper right of way leads to accidents. Many pedestrian accidents occur in crosswalks, but some also happen alongside roads. Pedestrians are always to use sidewalks when available. If a pedestrian is walking where there is no sidewalk, he or she must stay as far to the edge of the road as possible and walk in the opposite direction of traffic. Bicyclists should follow the flow of traffic. Accidents can also occur when pedestrians attempt to cross or walk along highways. New York law prohibits pedestrians from traveling along highways under any circumstances. Vehicles have headlights to make them visible in the dark, but pedestrians are more difficult to spot. Some accidents occur because motorists are unable to see a pedestrian on or alongside the road. Pedestrians walking in low light such as morning, evening, and inclement weather should wear light-colored or reflective clothing or carry flashlights to make them more visible to motorists. Intoxication can lead to accidents, both on the part of motorists and pedestrians. Alcohol and other drugs can cause drastic impairment of someone’s senses and motor functions. Drunk drivers may fail to react in time to obstacles on the road or be unable to drive their vehicles properly. A drunk pedestrian may easily wander into the road. Both parties may not notice each other and have delayed reaction times to any danger. In some cases, a driver may notice a pedestrian and react appropriately, but a vehicle failure will prevent the car from stopping on time, such as faulty brakes. Other accidents can result from parts failures, such as a busted tire. In these cases, the fault may rest with the driver for inappropriate car maintenance, or it may rest with the vehicle manufacturer due to faulty parts. Talk with a Long Island pedestrian accident attorney for help determining what caused your injury. The state of New York has long been one of the leaders in pedestrian accidents and fatalities in the country. Fortunately, that has been changing the last few years. With the lowest number of pedestrian fatalities since 1910 being recorded in 2017, we are beginning to see great results from all the measures that have been taken by state officials in the previous years. The table below showcases pedestrian crashes in the last 6 years we have on record. We can see how the number of fatalities plummeted down to 249 in the year 2017, down from 316 fatalities for the two consecutive years before. Data Source: The Institute for Traffic Safety Management and Research (ITSMR) 2018. Similar to the case with state-wide statistics, Nassau County has also seen a relative decline in pedestrian fatalities in the last few years. Although the number of fatalities is not the absolute lowest in history, the number of injuries is declining as well. New York State Department of Transportation 2018. The data in Suffolk County follows the path of Nassau County. 2015 was the most fatal year for pedestrians in Suffolk County with 53 fatal crashes. However, the number of fatal crashes has been slowly declining the two following years. The top contributing factors to fatal pedestrian crashes are Pedestrian Error/Confusion & Driver Inattention in Suffolk County. 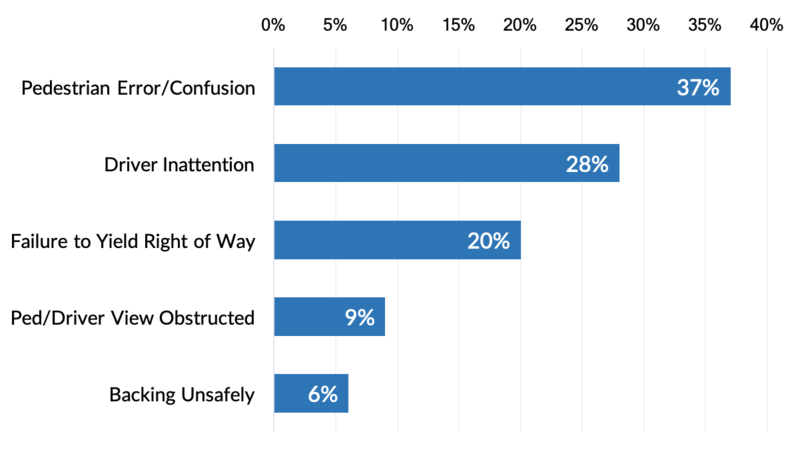 When comparing if pedestrian crashes are more prominent at intersections or not, the results were very similar to Nassau County, with 62% happening at intersections and 38% happening elsewhere. Seeking immediate medical help after a pedestrian accident on Long Island can help you document your injuries for use in your claim. Taking pictures of your wounds before treatment is also helpful as evidence. No matter what level of injury you suffer or who was at fault, you have a right to pursue compensation for both medical treatment and lost earnings. In order to recover for physical and emotional damages, you and your Long Island pedestrian accident attorney must show that the vehicle as at least partially at fault. Before getting behind the wheel of a car, motorists must prove their knowledge of the rules to protect themselves and others are the road. However, pedestrians don’t always know the rules and rights they have when walking on or near roadways. Many pedestrians assume they always have the right of way, which is not always the case. It is important to follow proper rules of the road for safety purposes. A pedestrian who does not follow the rules of the road may be at fault for the accident and can lose the right to recover compensation. New York law gives pedestrians the right of way at all marked crosswalks and sidewalks. Motorists should slow down at crosswalks and be alert for pedestrians. At crosswalks with traffic signals, both pedestrians and drivers must abide by the signals and give right of way to the appropriate party. For crosswalks without signals, pedestrians have the right of way to cross. Pedestrians have a right to walk safely along roadways. This means drivers must be cautious of any pedestrian activities on or alongside the road. If the lack of sidewalk requires a pedestrian to walk on the roadway, drivers must exert proper awareness. Drivers should also be even more on alert when driving around children or areas where children are likely to be present. While drivers must give the right of way to pedestrians under certain circumstances, pedestrians also need to follow proper laws when walking along roadways. If a crosswalk is available, pedestrians must use that crosswalk and obey any nearby traffic signals. It is only acceptable to cross a road at an unmarked point when there are no nearby crosswalks. In this case, pedestrians must give the right of way to any drivers. Pedestrians must use available sidewalks. Any pedestrian who walks on a road due to the lack of a sidewalk should walk in the opposite direction of traffic. Pedestrians are to also stay off any toll bridges or highways. Walking on the highway brings a major risk of extensive injuries, so New York law prohibits any pedestrians from walking alongside the highway. Pedestrians also have the duty to act vigilantly in all situations, even when they have the right of way. They should never assume vehicles will stop or slow down for them. If a pedestrian notices that crossing a roadway may be dangerous, they should wait until the danger has passed before crossing. Pedestrians failing to follow their duties on the road can result in accidents. If a pedestrian acts unlawfully, such as jaywalking or ignoring traffic signals, he or she may be partially or entirely at fault for the accident. Because of New York’s comparative negligence standard, pedestrians who contribute to their accidents can only receive partial compensation for their injuries. In these cases, the pedestrian will be at fault for the incident. Knowing your rights and responsibilities as a pedestrian is one of the first steps to avoiding accidents while on the road. These laws are in place to keep everyone safe, just like other traffic laws. When both pedestrians and motorists act responsibly, the risk of such accidents drops. If you have followed the correct rules of the road as a pedestrian and still were part of an accident, the fault may rest with the motorist. A knowledgeable Long Island pedestrian accident attorney can help you understand New York pedestrian law and investigate who was at fault for your accident. When a motor vehicle collides with a pedestrian, the consequences are often devastating for the pedestrian. We handle claims involving all types of injuries arising out of pedestrian-auto accidents, from soft-tissue to serious and catastrophic injuries, including broken bones, amputation or loss of limb, brain injury, or spinal cord trauma. 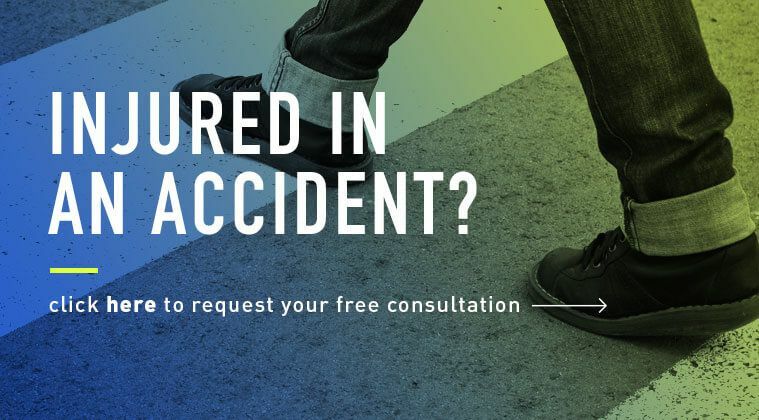 When you have been injured in a pedestrian accident, your first instinct may be to contact your health insurance carrier. Talk to us first! Your medical expenses should be paid by no-fault auto insurance and your insurer has a vested interest in paying as little as possible to settle your claim. We will work directly with your insurance provider to help you get all the benefits you have paid for and to which you are entitled. Our attorneys handle all pedestrian accident injury claims on a contingent fee basis. You will only be billed attorney fees if we recover compensation for your injuries. Our Long Island pedestrian accident lawyers provide a free initial consultation to people who have been injured in a pedestrian accident. Contact our office online or call us at (631) 451-7900 to set up an appointment. We will meet with you at a location that is convenient for you, including your home or the hospital if necessary.